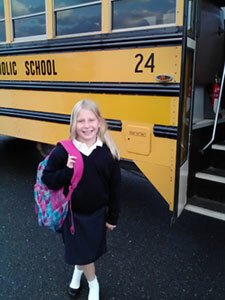 St. John Regional Catholic School shares school bus service owned and operated by Saint John’s Catholic Prep High School. The routes cover the Mt. Airy/New Market area, Urbana, Taylorsville, Gathersburg, Charles Town, and Northren Virginia. Shuttle service from the high school to St. John Regional and back is also available. Arrangements may be made for bus service directly with SJCP at 301-662-4210. This serivce is provided by SJRCS, and will not change the current serivce provided St. John Catholic Prep.